Dan drops by, like a diaper-bomb of doodie, to talk about nerd parenting. Or at least being a nerd who is the parent of a pink princess-loving diva. Episode topic suggested by Justin Mehr (whose nerd spawn provided the intro audio as well). If you’d like to learn more about being a nerd parent parenting nerds, the My Talking Head blog features an informative series by K.G. Smith called Nerd Parenting 101. The most legitimate or most dubious of all cosplay fandoms? ‘Tis a conundrum which is devilishly difficult to deduce an answer to. 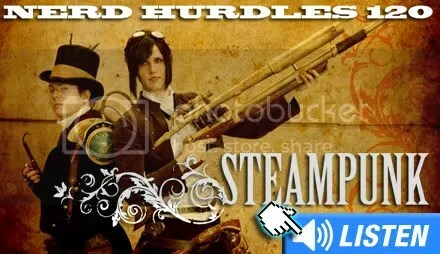 For a sub-genre that’s never had a bona-fide “even your mother knows it” hit, steampunk sports a deucedly large legion of dedicated followers. Perhaps this is due to this same underground status. Fans can be as creative as they want without dressing like any particular character. And what razzes a fan’s berries more than their favourite games, books and movies being virtually unrecognized by the general public? Or the general public being unaware a film such as Wild Wild West is part of a larger subculture (though perhaps steampunkers would like to forget about that one too).